Hilary Smith sent me a post and Infographic on her recommendations to protect children from online predators. I’ve posted about this in the past and thought her advise could be helpful for parents with children using the internet. From Hilary: One look at the information in today’s infographic makes it clear that children – the least security-conscious people on the planet – are having their vulnerabilities exploited. Since we know the problem, let’s talk about solutions. Ah, social media – a place where you can send a message to anyone at any time. Unless, of course, they took the basic security measure of rejecting communication requests from anyone who isn’t on their list of accepted friends. I’m just going to say what we’re all thinking: Kids don’t need to be able to talk to anyone. They don’t. If your child’s old enough to have a social media account, ask them to show you their privacy settings and ask them why each one is configured the way it is. In general, they should have things configured so that only people they’ve added to their friends list can contact them. If that function isn’t available on the type of social media they’re using, they probably shouldn’t be using it. They should also refuse to add someone to their friends list unless they actually know that person in real life. 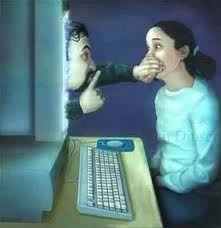 Online predators generally pretend to be the child’s friend. There are ways of having regular conversations without specifically adding someone to a Friends list, and if people won’t take “no” for an answer (or worse, try to pressure the child into accepting the request), that’s a major red flag. Look, kids don’t make good choices. They just don’t. Even when they’re told over and over that certain things are wrong, they’ll make a mistake as soon as they think they’re in control of the situation. I wish this weren’t true, but you cannot trust teenagers to do the right thing. No matter how responsible they are, no matter how mature they are, no matter how much it seems like they’re a master of technology, they can (and frequently do) make mistakes. If you really want to keep them safe, you have to start doing things like tracking their phone, vetting their friends list, and checking their text messages to be sure they’re not being lured in by a silver-tongued predator. This gets a lot easier if the kid in question has no expectation of privacy and knows that anything they write can be seen at any time. To make it easier, have a written contract – yes, an actual printed agreement, with signatures and everything – covering the rules for the internet in your house, why they must allow you to check their messages and history, and what the consequences will be if they break the agreement or try to hide what they’re doing. Teenagers tend to value things that suggest they’re mature, and saying they’re mature enough to have an agreement like this is usually enough to get them to sign it. Start young if you can – if they’ve never had the freedom of unsupervised internet use, they won’t miss it. More importantly, this will help keep them safe.